Fabric & surface design is a huge passion of mine. I love creating repeating patterns that can be utilized and put on a variety of products including fabric. Below is a sample of some of my fabric design work. I am available for licensing and custom pattern work. Contact me for more info. Designs are available for purchase on Spoonflower.com on a variety of fabric types, gift wrap and wallpaper. Pansies are associated with many great qualities including humility, cheerfulness and remembrance. This Gracious Pansy design features a field of illustrated flowers. 5 different colorways are available. Find the perfect one for your project. A bold geometric pattern featuring a crab perilously playing with a beach ball. Great summer pattern for clothing, accessories or fabric. Currently in two colorways including bright yellow and pink. Shop on Spoonflower. This fabric features an original pen and ink illustration of fish that has been colored with watercolor. Little watercolor dinosaurs roam and peek out from behind floral elements. Available for purchase as fabric, wallpaper, and gift wrap on Spoonflower. This watercolor floral print was created with original watercolor illustrations. Available for purchase as fabric, wallpaper, and gift wrap on Spoonflower. This design features an original illustrated olive pattern with canned olives, leaves and flowers. 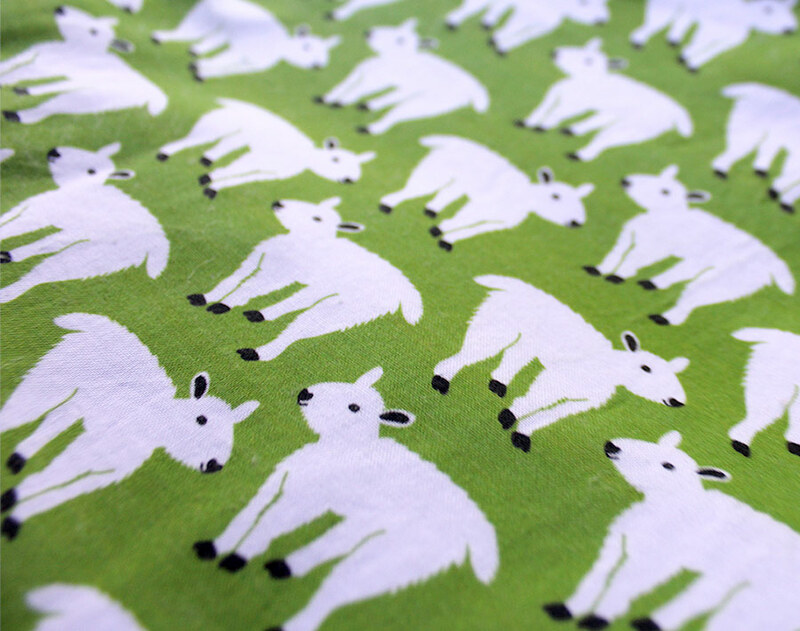 Illustrated happy mountain goats on glorious grassy green fabric. Shop on Spoonflower. The cockatiel pattern is from my growing collection of modern birds fabrics. These creatures have a lot of personality and beauty, and I wanted the pattern to reflect that through the use of bold colors and shapes. This design comes in four colorways: cream, deep blue, grass green and orange. Available for purchase as fabric, wallpaper, and gift wrap on Spoonflower. A perfect print for the holidays, this large ornaments design is reminiscent of the stunning glass ornaments from elegant Christmas celebrations. It is a minimal but effective print featuring red, teal, and white ornaments on a deep gray background. This print is great for making tree skirts, holiday gifts, and decor. The Winter Wear pattern collection features an original illustrated pattern of winter clothing essentials on a dense, snowy backdrop. It comes in three colorways: light blue, dark blue, and gray. The collection also includes a series of fabrics featuring small ornaments using the same color palette. Available for purchase as fabric and gift wrap on Spoonflower. Summer Sweets is a collection of illustrated patterns featuring favorite summer treats. The patterns express the upbeat mood of summer and have a retro color palette to enhance the feeling of carefree nostalgia. 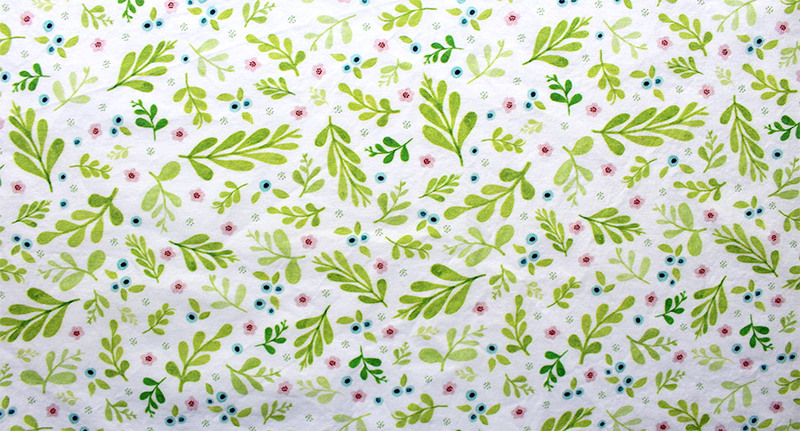 The collection is available for purchase on Spoonflower in a variety of fabrics including organics, knits and cottons. These fun versatile prints work well as home goods including napkins, pillowcases, tablecloths, and kitchen towels, as well as in a nursery setting as blankets, bibs and clothing for infants and children. Rainy clouds on a rich gray background. Minimal and modern. Available for purchase on Spoonflower.com. This fabric pattern features pansies in brilliant pops of color on a pink background. 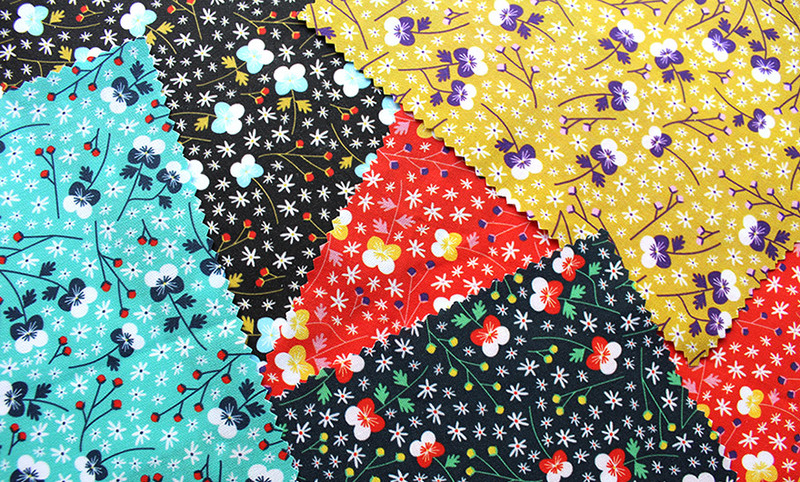 A super sweet print that pairs well with more neutral colors and patterns and great for quilting projects. Available on Spoonflower.com.